You're wrong, Changeling. The intro was from the late Hotline, started to be used in late Summer 1990. I saw this intro in the Navy Seals, but the music is was Dee-Lite - Groove is in the heart.. It was verrrry cool. And yes, this intro had FOUR different designs. Never liked this one. Can't really say why, but it never got to me. Yes this intro was in Last Ninja, Bad Dudes,R-Type. 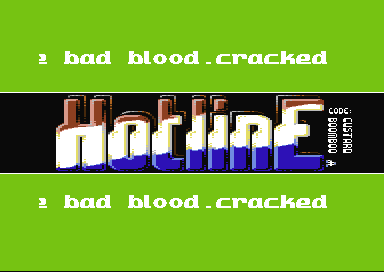 We Imported few cracks with Hotline. Greetz to the Elites, Lamerz DIE! "What game is this for?" This is one of my alltime faves! Great logo! This intro has three different designs. Random at launch.